This is Commander Walter Reese on board the USS Einstein. I'm pleased to say our spaceship has entered orbit around the planet Saturn. As you can see from the pictures we've been sending back, the view is magnificent, though a photo cannot do justice to the view outside our main window. The planet's colors are more vibrant than can be captured with the cameras and the rings are these huge plains that seem to be woven out of some delicate, colorful fabric. Tomorrow we will be starting our maneuvers to bring the Einstein to a rendezvous with Saturn's moon Enceladus. The low gravity will allow us to actually land on the surface and do some exploring. Well, time for me to sign off. We've set up tables on the main deck's centrifuge and the cook has thawed out several turkeys for the ship's holiday party. They're waiting for me to come so they can start the festivities. Let me just wish everybody back on good old Earth happy holidays from myself and the other forty members of our crew..
Is this an excerpt from some old science fiction novel written before people realized that man would only have gotten as far as the moon by 1969 and no further by the end of the century? No, this is what might well have happened if history in the early 1960's had gone just a little differently, and a bold, exciting and risky experiment known as Project Orion had been allowed to continue. 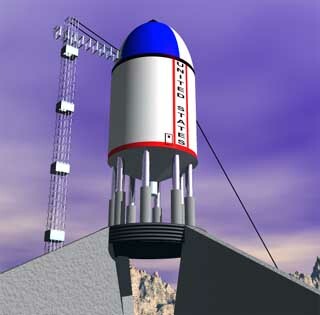 The object of Project Orion was to build a spaceship powered by atomic bombs. The idea for this method of transportation, later known as a nuclear pulse propulsion, started with Stanislaw Ulam. Ulam was a fan of Jules Verne and recalled how in his book From the Earth to the Moon Verne proposed using a huge gun to send a space capsule with explorers to the lunar surface. While working as a scientist on the construction of early atomic bombs Ulam found himself, after one test, thinking about how all the energy released by the bomb could be used to propel something into a ballistic trajectory, much like in Verne's book. Years later the Atomic Energy Commission would patent the concept of nuclear pulse propulsion in the names of Ulam and another scientist, Cornelius Everett. An Orion Ship sits on a pad at Jackass Flats ready for a test launch. A barge in the Pacific was considered as an alternate launch site. Copyright Lee Krystek, 2003. Nuclear power is an extremely attractive way to power a spaceship. Rockets with chemical fuels, like those used in the Mercury, Gemini, Apollo and now the space shuttle programs, produce a relatively small amount of energy for the weight of the fuel. 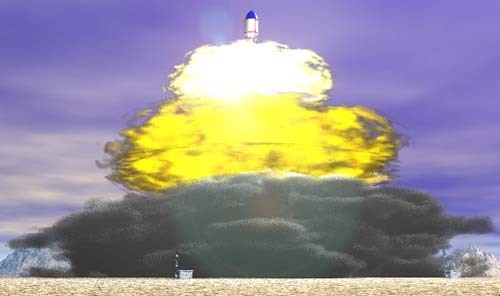 A rocket powered with a nuclear reaction, however, could produce a huge amount of energy from a very small amount of fuel in the same way a nuclear bomb produces a huge explosion compared to a conventional bomb of the same weight. There are two obvious ways of producing energy by nuclear reaction. The first is a controlled nuclear reaction, such as used in electrical production facilities and submarines. The second is an uncontrolled nuclear reaction such as an atomic bomb. Trying to put a power reactor on a spaceship was a complicated proposition. A simpler approach would be to use an uncontrolled nuclear reaction (a bomb) to shoot a vessel into space. Ulam and Everett, thinking about this in the mid-50's, realized that the extreme acceleration of such a blast would easily crush any members of the crew to a pulp and even destroy an electronic guidance system. To solve this problem, they decided that the ship should be powered by a series of small A-bombs, perhaps ejected out the back of the vessel in one second (later to be shorted to 1/4 second) intervals. This mitigated the shocks somewhat, but still created too much acceleration to be tolerated by a human crew. 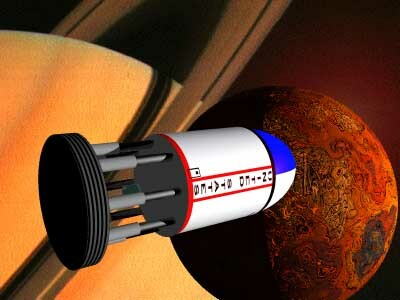 Another scientist, Ted Taylor, who found himself intrigued by the idea of a nuclear bomb driven spaceship, came up with the idea of adding a shock absorber to the bottom of the ship. A large heavy round plate (later to become known as the "pusher plate") would take the initial blast and transmit the acceleration to the rest of the ship through a set of column-like shock absorbers. Fission, Fusion and Chemical Reactions: What's the Difference? Almost every reaction we see here on Earth is a chemical reaction. When we burn wood (a chemical reaction) energy stored by the tree while growing is released as the matter involved changes form. As much as the wood seems to be disappearing, if we could recapture the ashes, soot and gases released by the fire we would find that we have exactly as much matter at the end of the reaction as we did at the beginning. Nothing was lost. Nuclear reactions are different, however. In a fission reaction, atoms are split and some small amount of matter is turned into energy. With billions of atoms in just a pound of matter, a fission reaction can release a huge amount of energy. This is the principal behind an atomic bomb. Fusion is another nuclear reaction. This is the process by which the sun produces its energy. An H-bomb uses fusion to combine hydrogen atoms. The result is even more energy than produced by a fission bomb, though a fission bomb is generally needed at the heart of an H-bomb to create the tremendous heat and pressure to get a fusion reaction going. In 1956 scientists at the newly-formed General Atomic Corporation, including Taylor, began thinking seriously about how such a spaceship could be built. They called the effort "Project Orion." General Atomic managed to interest the Air Force in doing some preliminary studies and started tackling the technical problems one by one. Would the pusher-plate be worn away by exposure to so many successive atomic explosions? Tests indicated that wear would be minimal and could be eliminated completely by spraying a thin film of oil on the bottom of the plate between each detonation. What would happen if a bomb failed to explode? The shock absorber mechanism would have to be strong enough that the pusher plate would not go shooting off into space if on its rebound it wasn't stopped by the next detonation. What if the bomb ejector jammed? A jam early in the launch sequence would doom the ship to a fiery crash into the ground. One proposal to solve this problem was to have several ejectors working from the edge of the pusher plate. If one jammed, the others could continue. More ejectors also meant that the ejector mechanism would have more time to load the next bomb, making the engineering easier and lowering the chance of a jam. The scientists tackled the project with unbounded enthusiasm. What was so exciting about the concept of Project Orion was the scale of the spaceship. While most chemical rockets must use most of their mass for fuel, Orion would use only a small part of its total mass for this purpose because nuclear reactions are so much more powerful than chemical reactions. This meant most of the ship's mass could used for food, space for passengers and scientific equipment. With the Apollo missions that flew to the moon, for every 600 pounds that was sent into space, only one pound returned to Earth. The rest was used up as fuel or expended as lower stages of the rocket. It was estimated that an Orion ship, using nuclear pulse propulsion, would be able to send ships to Mars with 1.5 pounds of launch weight for every pound returned. A mission to Saturn would require 5 pounds of launch weight for every pound returned. By 1958 the team was planning test vehicles including an orbital model eighty feet in diameter, 120 feet high and weighing 880 tons. It was estimated to need 800 bombs ranging from .03 to 3 kilotons in power to put the ship into orbit. The launch would be from Jackass Flats at the Nevada Test Site near the locations used to test nuclear weapons. Later versions of the ship might be launched from a barge in the Pacific Ocean. A single nuclear explosion is quite an incredible sight and eight-hundred of them detonating at quarter second intervals would be almost unimaginable. Team member Ted Taylor was quoted in George Dyson's Project Orion as saying about the launch, "The first flight of that thing [Orion] doing its full mission would be the most spectacular thing that humans had ever seen." The scientists estimated that a trip to Mars would be possible as soon as 1965. The unofficial motto for Orion Project soon became "Saturn by 1970." The enthusiastic engineers at General Atomic, some of the brightest people on the planet, were completely serious about this goal. By the late 50's, Orion began showing some technical problems. They were not in getting the spaceship to Saturn, but what would happen back on Earth after an Orion ship departed. Both the Soviet Union and the United States had been testing atomic bombs in the atmosphere for years and fallout was becoming an increasing hot issue. Some estimates showed that the increased radiation in the atmosphere from these tests were killing a thousand people a year by increasing the rate of cancer and related diseases. Eventually the bomb tests would be moved underground and stopped completely, but this was not an option for Orion. Each mission was estimated to cost ten lives because of an increased cancer rate. Schemes to reduce this number by making cleaner bombs or using chemical boosters to get the ship into orbit before using the bombs decreased the number of deaths, but did not eliminate it. The death of the Orion Program came not because of fallout concerns, however, as much as through politics. The contract for Orion was originally funded by the Air Force, but by the early 1960's all space exploration programs were being turned over to the newly-created civilian aerospace organization NASA. NASA wasn't interested in Orion and the Air Force could not justify spending money on such a large spaceship that didn't have a military function. Although research on the concept continued through 1965, most of the interest in space exploration went to NASA and the Apollo program. There was no mission to Saturn in 1970. How would history have changed if the government had given the Orion Project the type of support it gave NASA during the early 60's? Could Americans have been exploring Saturn by 1970? Certainly there was an element of naiveté in the General Atomic scientist's plans about how easy space travel will be. A whole host of issues explored by NASA, including the medical affects of long duration spaceflight on the human body, were not being considered. Perhaps the scientists, so long involved in the building of nuclear weapons for the purpose of mass destruction, had finally found a positive, uplifting goal for their skills and they went at it wholeheartedly, not taking some of the difficulties of spaceflight into consideration. 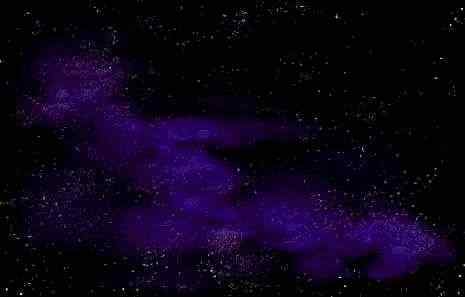 The concept of using nuclear fission to drive a spaceship is far from dead, however. Even NASA is thinking about how one might build a spaceship to visit other stars based on a fission reactor. Even nuclear pulse engines might be safe to operate if launched from a base on the moon. One can only wonder, though, if the money spent on NASA and Apollo in the 1960s had been spent on Orion instead, could most of the negative issues, including fallout, have been resolved? It might not have been "Saturn by 1970" but perhaps "Saturn by 1980?" Project Orion, by George Dyson, Henry Holt and Company, 2002. The Road Not Taken (Yet), by Glenn Harlan Reynolds, http://techcentralstation.com/1051/defensewrapper.jsp?PID=1051-350&CID=1051-091102C, 2002. Copyright 2003, Lee Krystek. All Rights Reserved.